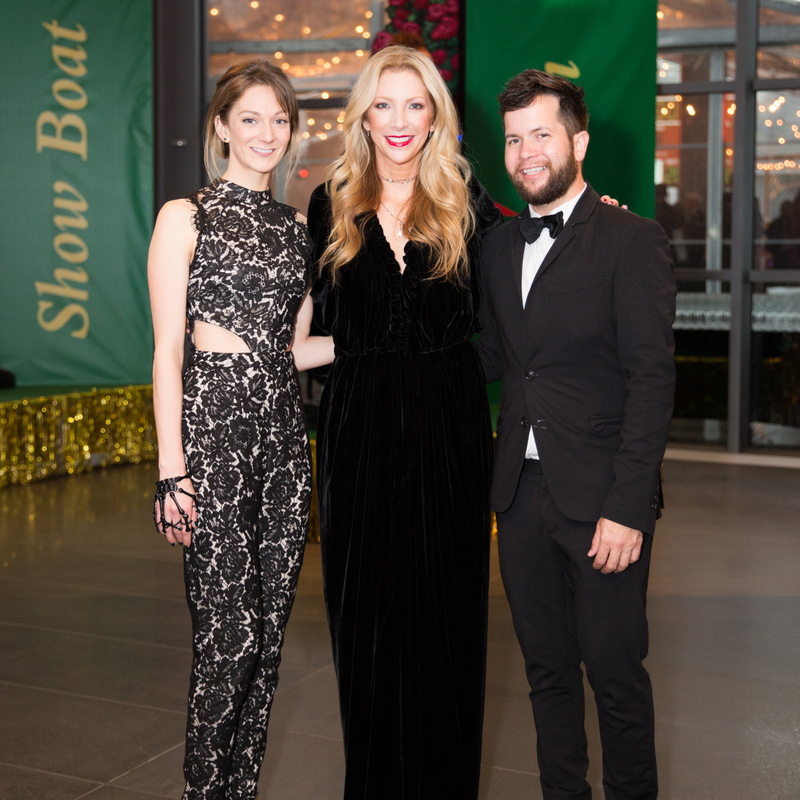 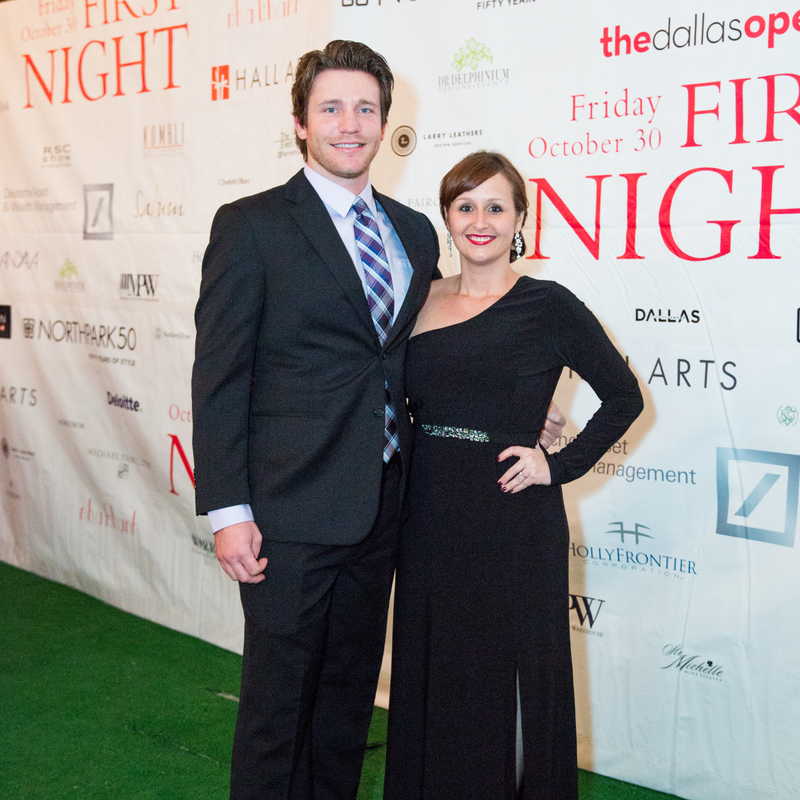 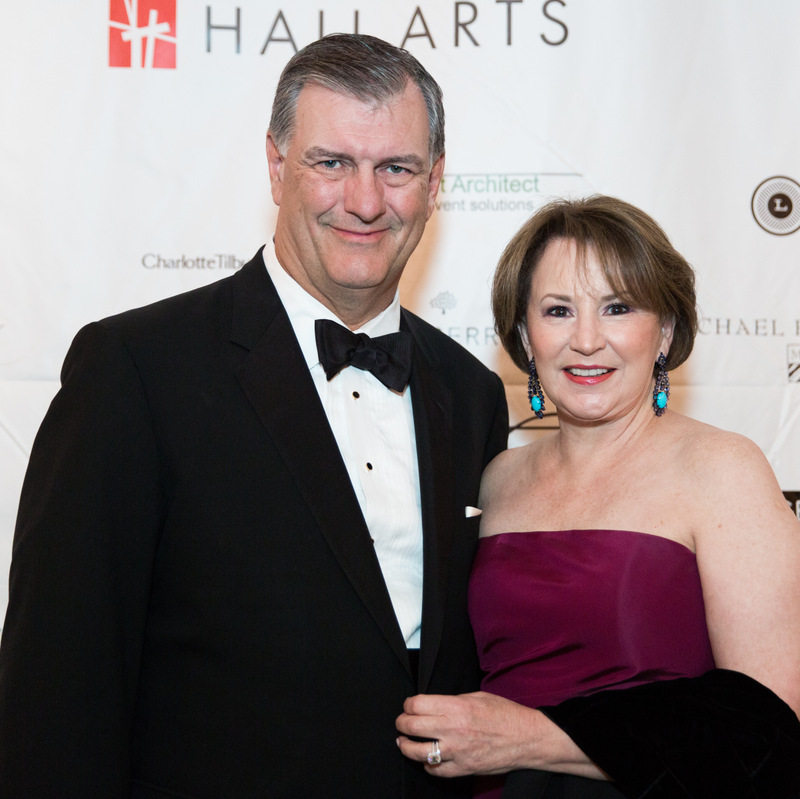 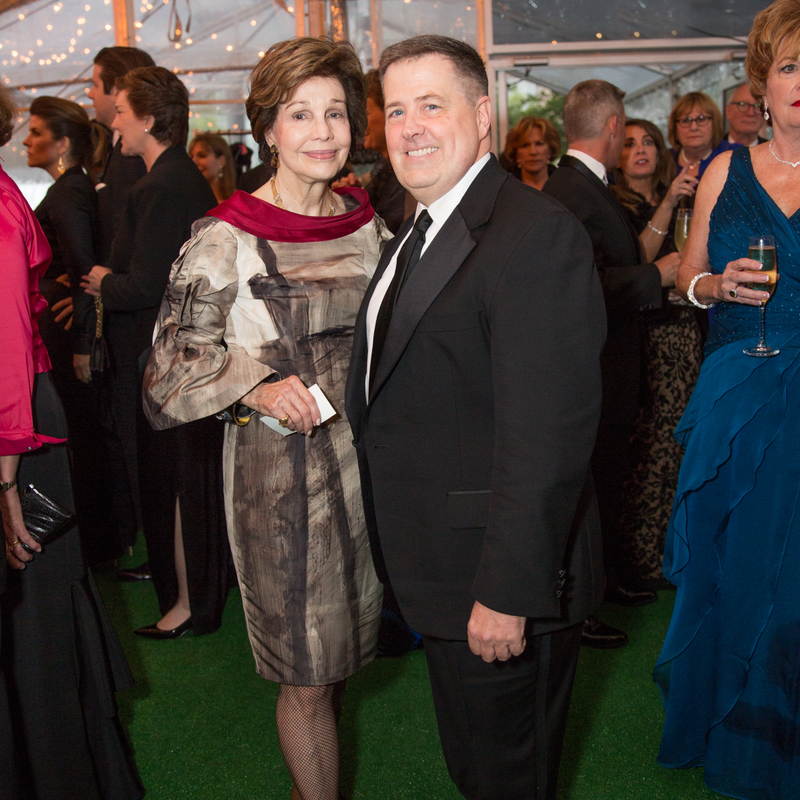 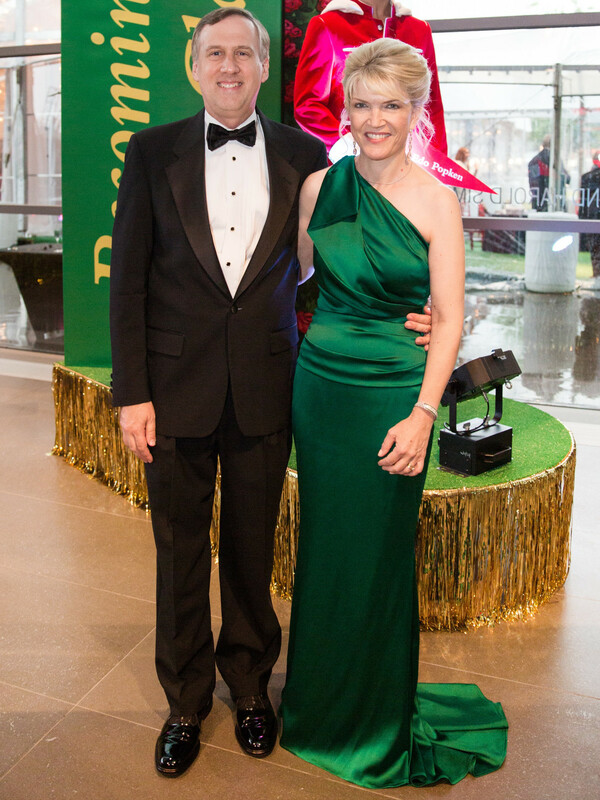 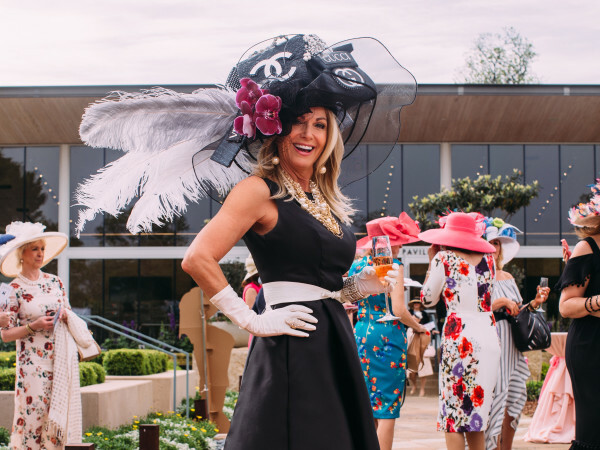 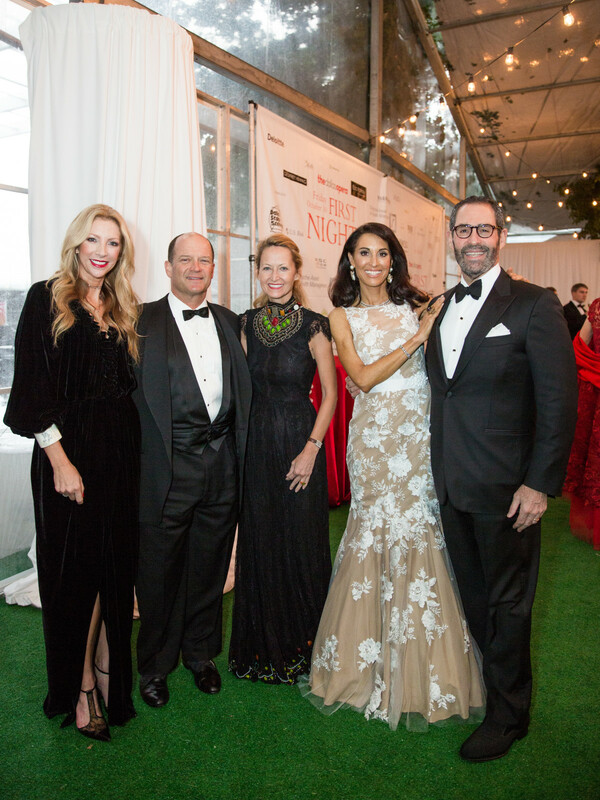 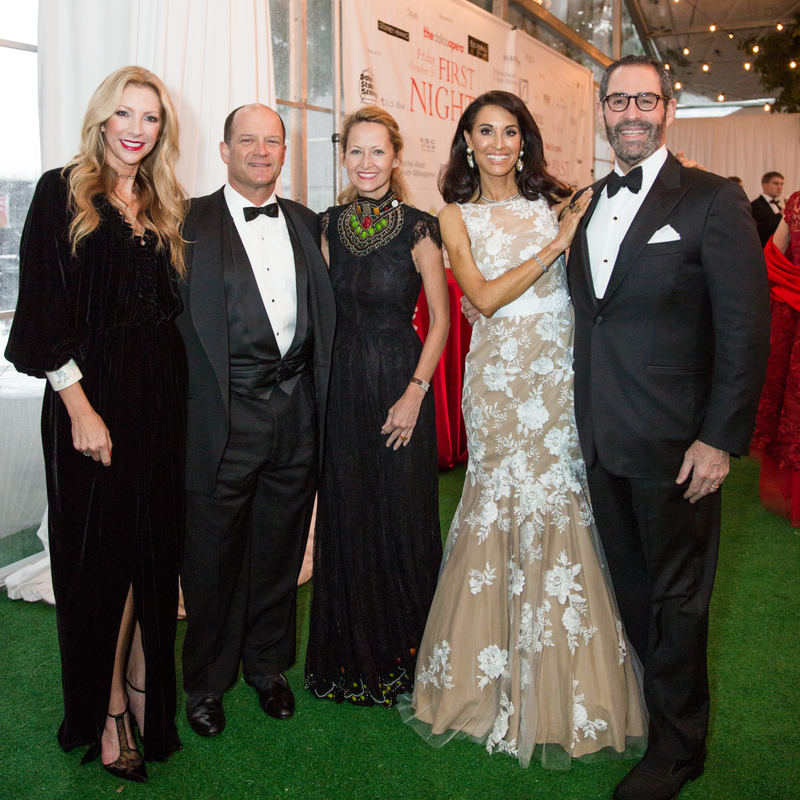 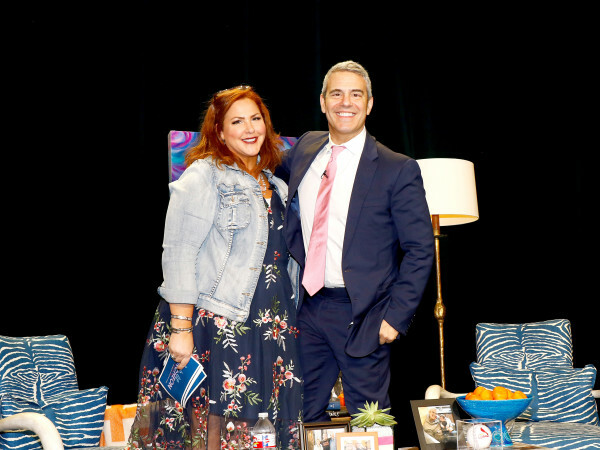 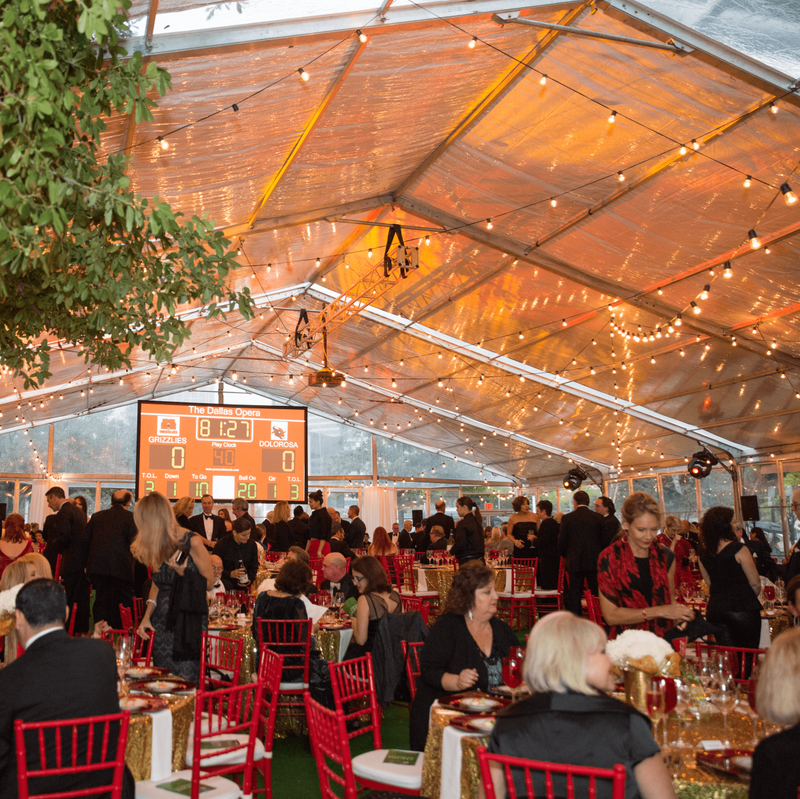 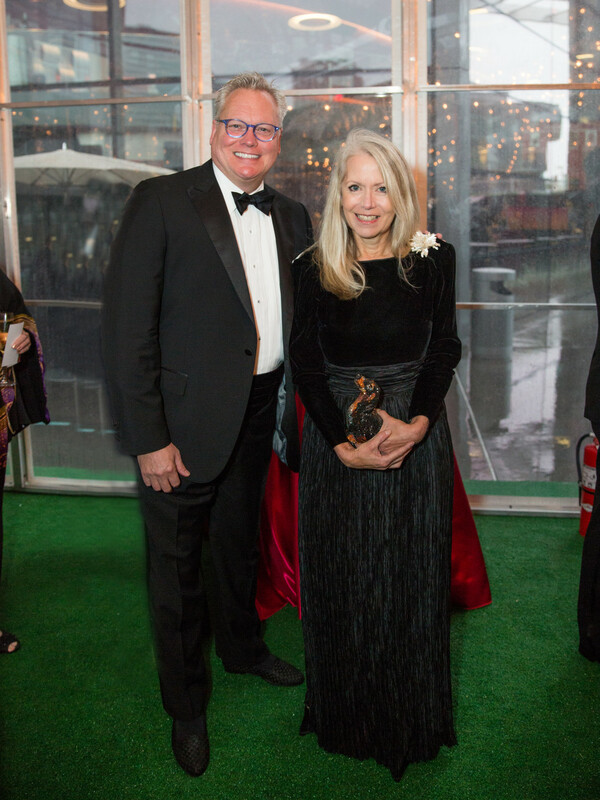 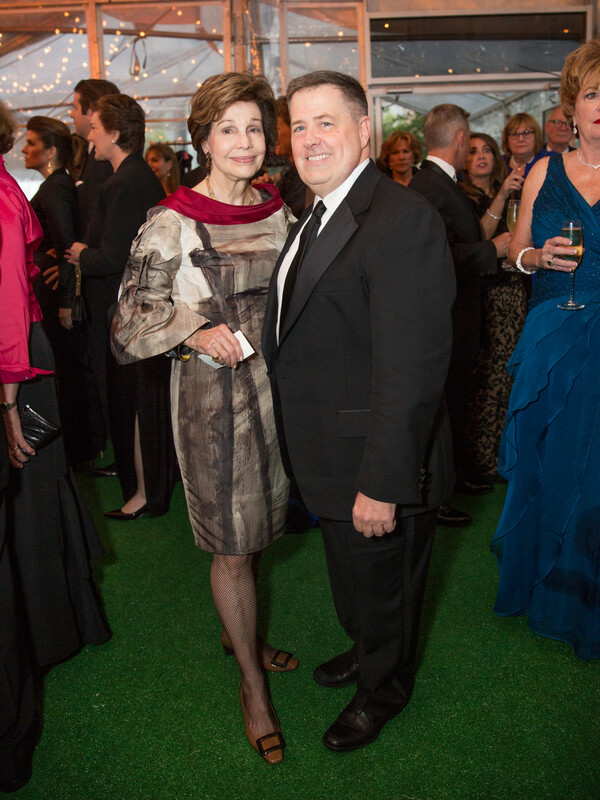 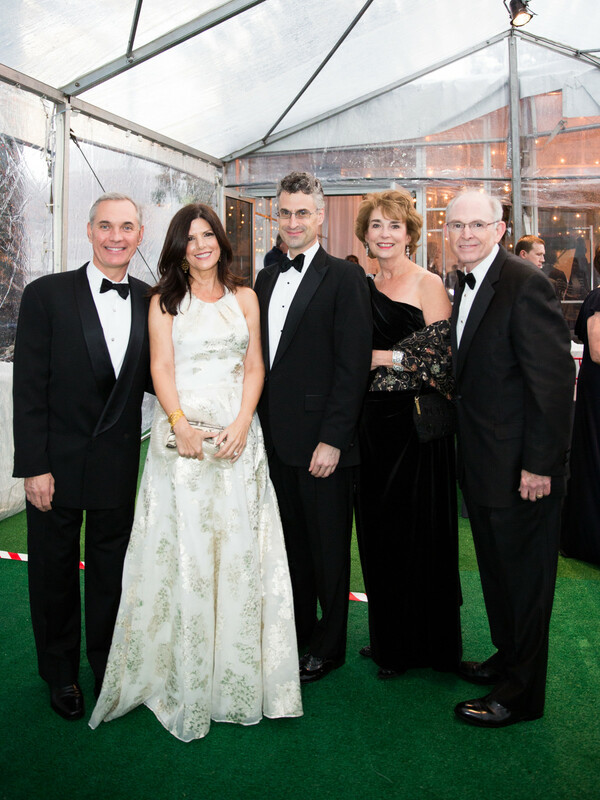 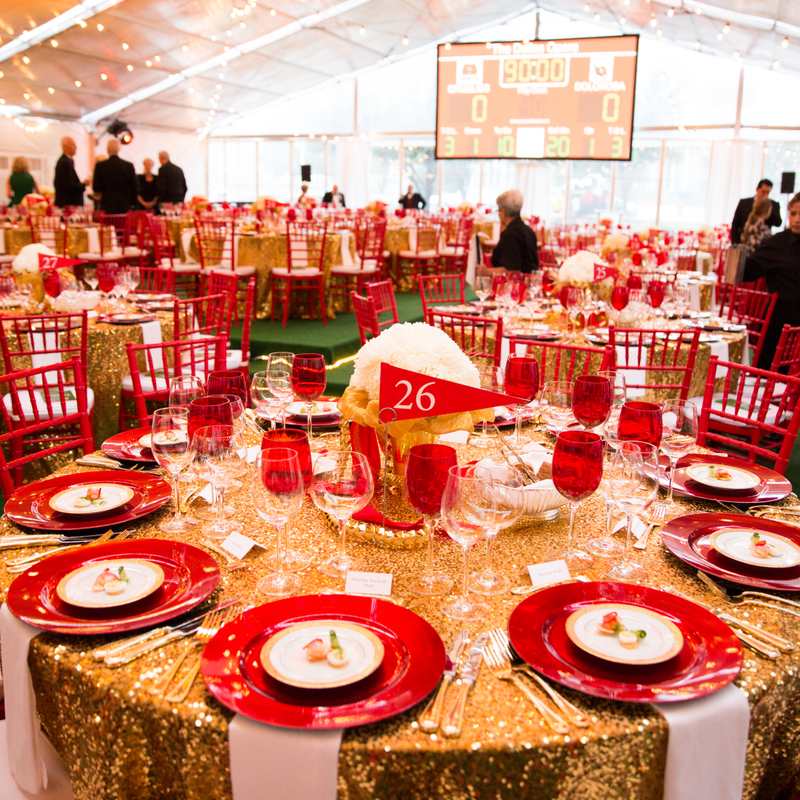 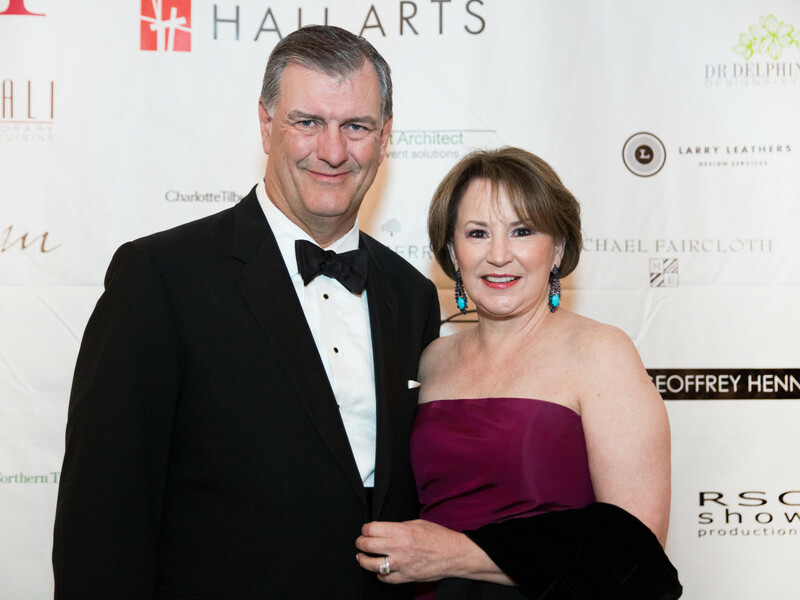 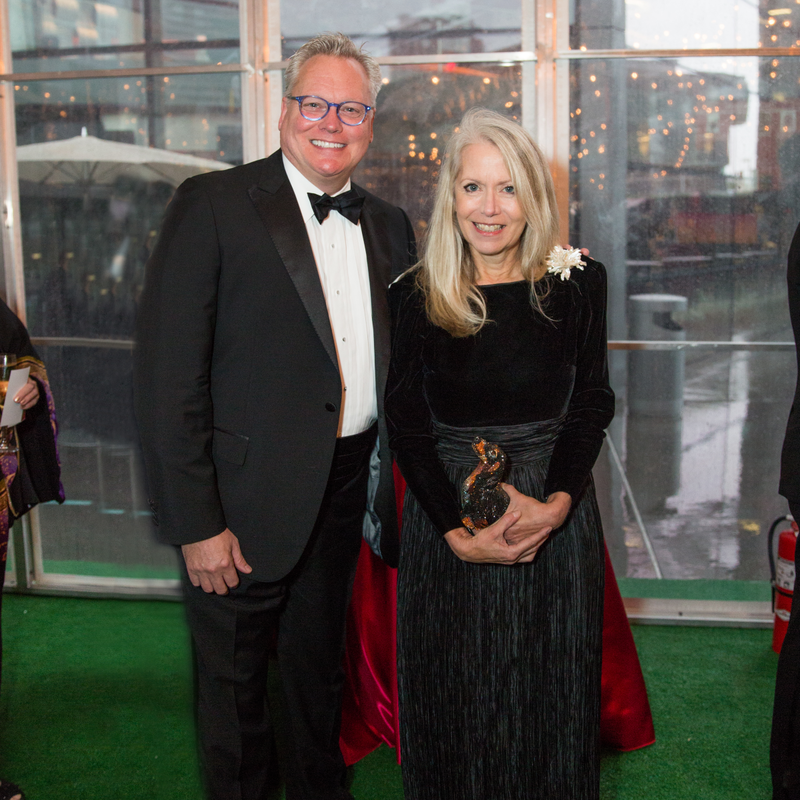 Dallas Opera's First Sight luncheon and fashion show may have given supporters a glimpse of this season's glamour, but there were still plenty of stunning surprises at the following evening's elegant First Night gala. 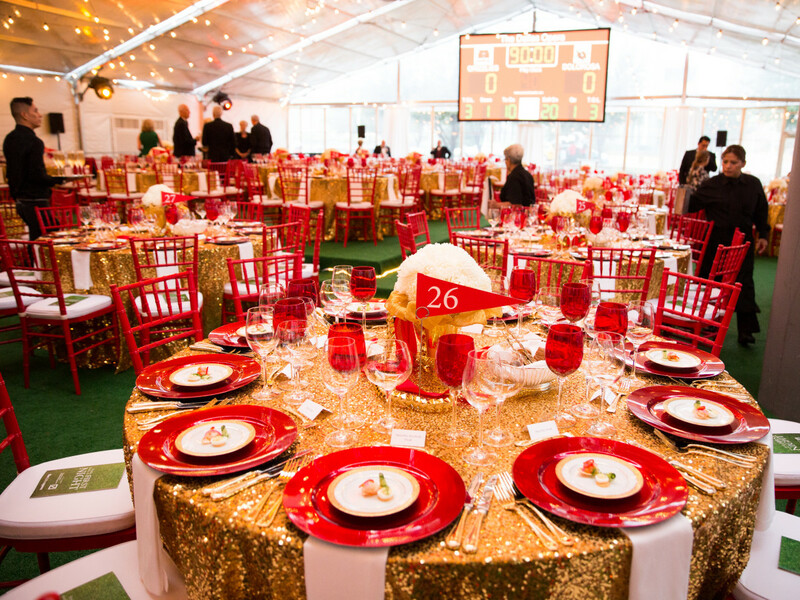 The theme of opera and football would soon make sense to all who were about to experience the world premiere of Great Scott, written by Jake Heggie and Terrence McNally. 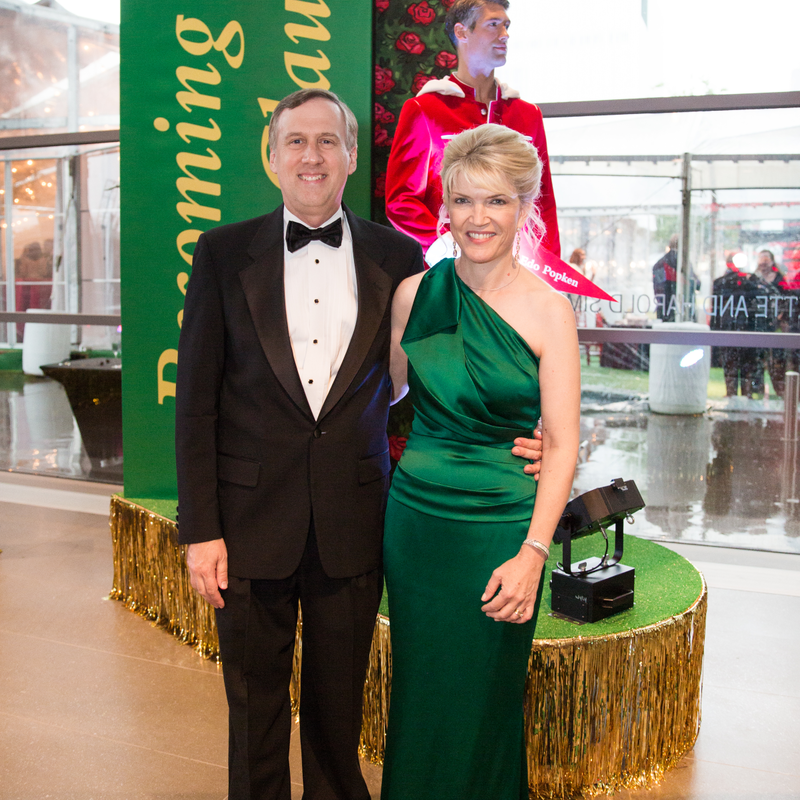 Starring superstar Joyce DiDonato, the season opener is about a famous singer who returns home to save her struggling local company, while also going up against the town's football obsession. 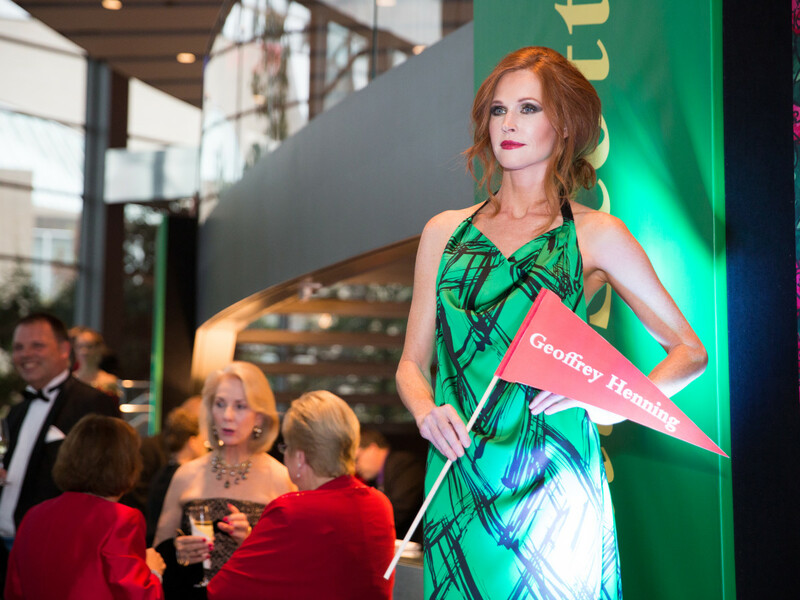 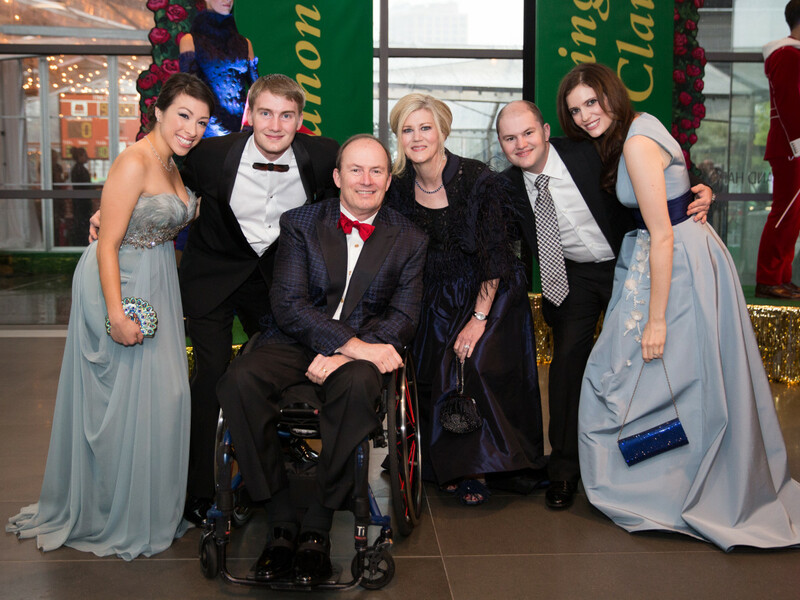 Inside the Winspear Opera House lobby, guests could view the gorgeous gowns and suits from the First Sight fashion show. 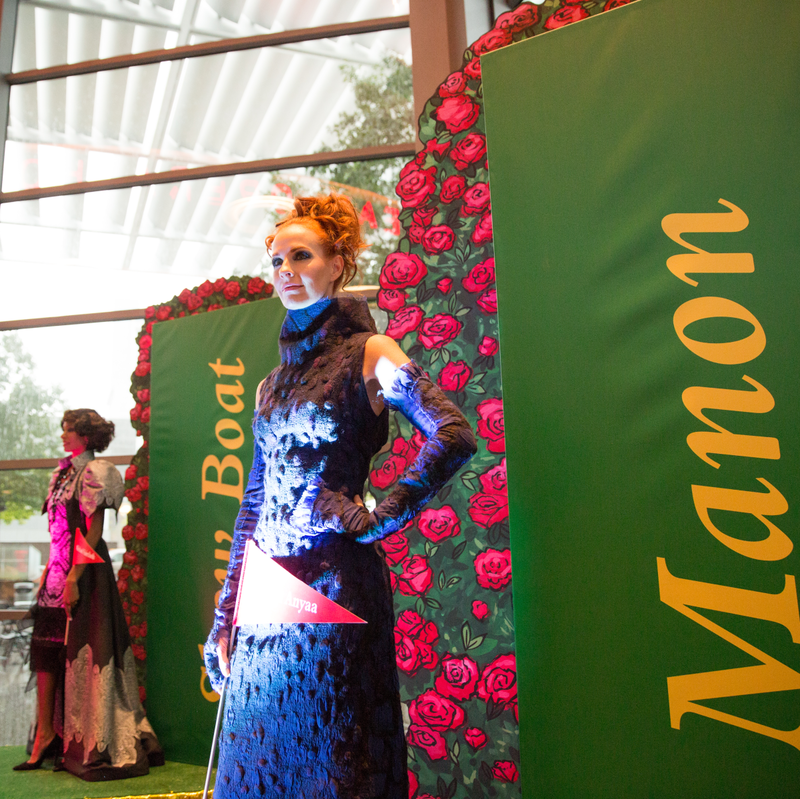 Created by local designers, the looks personified each show in the opera's upcoming season, which also include Tosca, Becoming Santa Claus, Manon, and Show Boat. 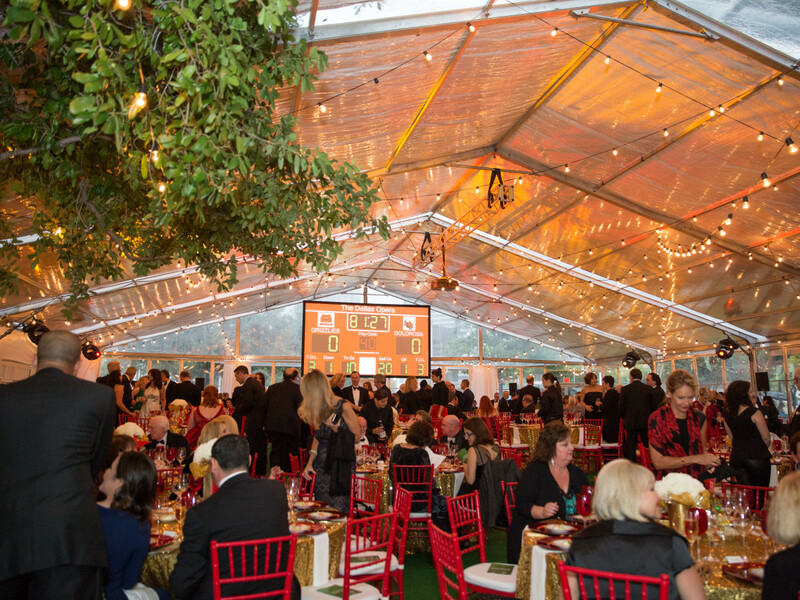 Outside the Winspear at Sammons Park, under a shimmering tent erected to keep out the rain, 325 patrons dressed in their black-tie best and assembled for a pre-performance dinner. 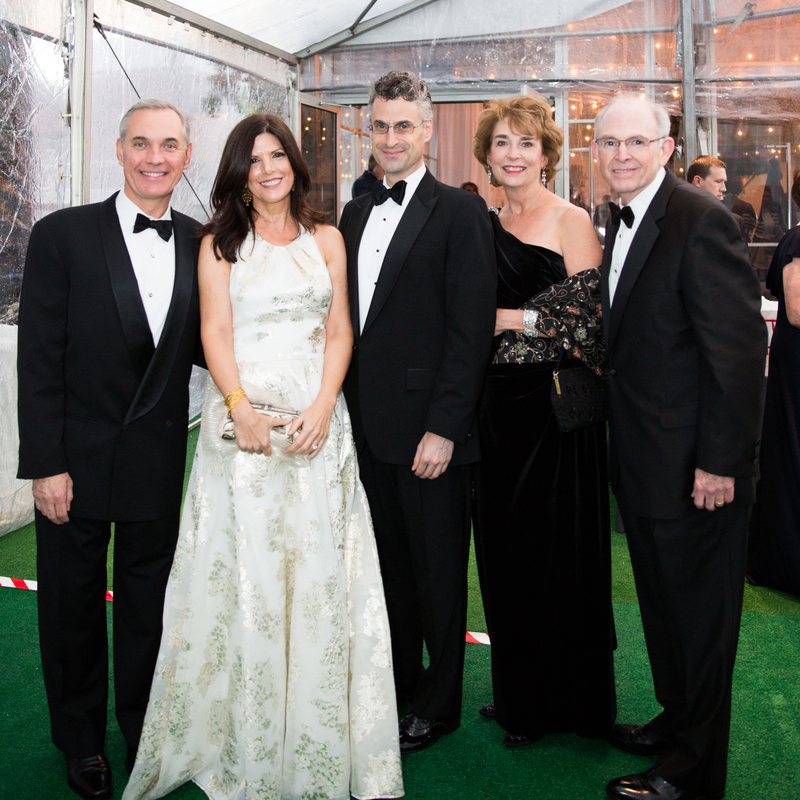 Chairs Ellen and Don Winspear and honorary chairs Micki and Mayor Michael Rawlings, along with dinner chairs Anne and Steve Stodghill, welcomed all with a hilarious thank-you video written by Ellen Winspear. 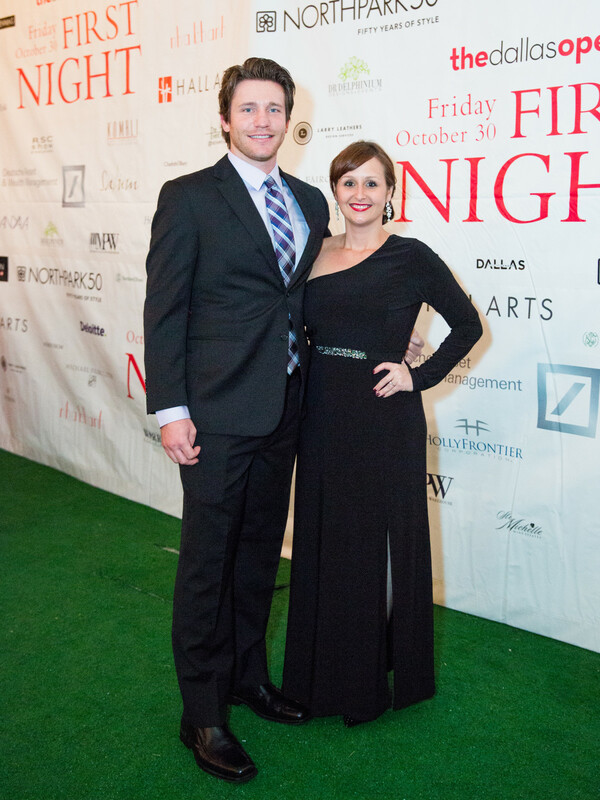 Using an audition theme, Mayor Rawlings donned a football uniform, Steve Stodghill wore a Batman costume, and Mark LaRoe dressed as an investment banker dripping in dollar bills, and they all attempted to deliver a line to get cast for the First Night video. 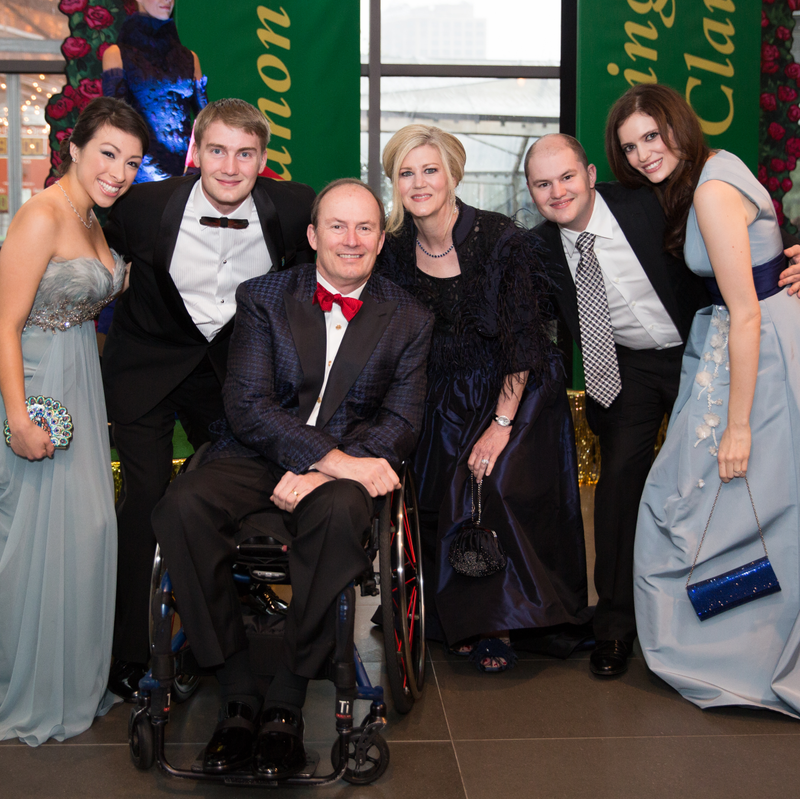 The Winspears also crashed DiDonato’s dressing room so Ellen could try on gowns and channel her inner diva. 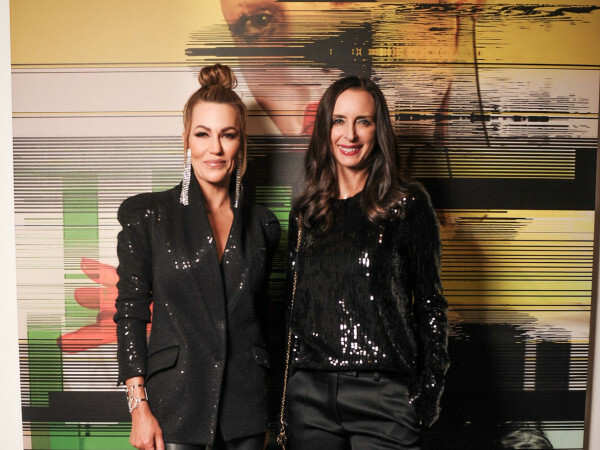 Following the debut of Great Scott, the exhilarating event continued with the after party, where partygoers danced to DJ Lucy Wrubel’s groovy selections and dined on football stadium-themed bites.